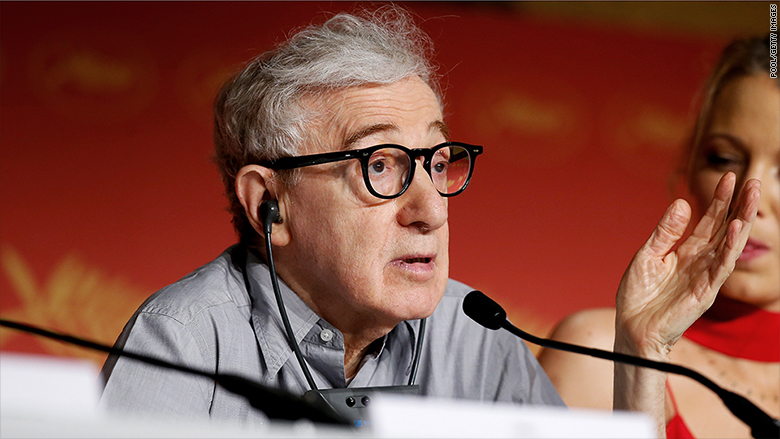 At the Cannes Film Festival on Thursday, Woody Allen sidestepped questions from reporters about Ronan Farrow's essay calling him a "predator." Allen told a group of reporters that he hasn't read it and won't ever read it. "I've said all I have to say about" the controversy, the filmmaker said, according to Variety. On Wednesday, in a piece published by The Hollywood Reporter, Farrow challenged the media to cover sexual assault allegations against his estranged father more assertively. That's why it was noteworthy that The Hollywood Reporter was not in attendance at the reporter luncheon with Allen. Matthew Belloni, who is in Cannes leading the entertainment publication's coverage of the festival, said reporter Tatiana Siegel was "banned." "Woody's publicist banned THR from a lunch for his movie in retaliation for publishing the Farrow piece," Belloni said. "Which is a bit ironic considering Farrow's argument centered on how Allen's PR machine tries to manipulate media with tactics like denying access." Farrow had no further comment, but he highlighted The Hollywood Reporter's absence at the event by retweeting several comments about the "ban." Allen's publicist, Leslee Dart, did not immediately respond to a request for comment. Reporters from Variety, Vanity Fair and other publications were invited to attend the luncheon on Thursday. It was held to promote his new film "Cafe Society," which premiered at Cannes a few hours after Farrow's piece was published. Farrow wrote that "I believe my sister" Dylan, who has alleged that Allen inappropriately touched and sexually assaulted her. "I've approached the case as an attorney and a reporter, and found her allegations to be credible," he wrote. "The facts are persuasive and well documented." Allen has never been convicted of a crime. Farrow said this fact is important to note, but "it is not an excuse for the press to silence victims, to never interrogate allegations." He sharply criticized journalists who shy away from pressing Allen and his movie collaborators in order to protect relationships with Hollywood publicists. In a followup with CNNMoney, he said, "If you're sitting at Hotel du Cap filing a Q+A with Blake Lively that asks who she's wearing but not why she worked with an alleged child molester, it might be time for some soul searching." On Thursday, reporters asked Allen about the issue several times. According to Variety, Allen responded by saying that "I never read anything about me, these interviews I do, anything. I said everything I had to say about that whole issue in The New York Times. I have moved so far past it. I never think about it. I work." In 2014 he wrote in The Times that "I did not molest Dylan"; that she was "taught" by her mother Mia Farrow "to hate her father"; and that he would never speak about the matter again. On Thursday, he seemed to compare Farrow's assertions to a critic who pans one of his films, saying it's better not to consume any of the commentary about him. "But this isn't a critic," a Variety reporter said. "It's your son." Allen answered, "I've said all I have to say about it." Farrow, a reporter for NBC News with a recurring investigative series on the "Today" show, told CNNMoney on Wednesday that his essay won't be the last time he speaks about the issue. "We don't always get to speak truth to power as reporters, but I try to grab the opportunities I do get," he said. "I'm working on a story involving sexual assault survivors right now that I hope will handle these issues correctly. I hope my 'Today' series and whatever else I do in the future can play a part in giving voice to people who need it." --THR editor Janice Min will appear on CNN's "Reliable Sources" on Sunday.